Chuck Schumer, the Senate’s third-ranking Democrat, hopped on the Hillary Clinton 2016 bandwagon early on Saturday night. Though Clinton has yet to announce that she intends to run for president — and, who knows, maybe she won’t! — Schumer endorsed her during a speech at an Iowa Democratic Party dinner. “It’s time for a woman to be president,” Schumer told the crowd. “And so tonight, here in Iowa, and I won’t get this opportunity again, I am urging Hillary Clinton to run for president and, when she does, she will have my full and unwavering support.” And, perhaps borrowing some language from the Senate Democratic coven that not-so-secretly encouraged Clinton to run last week, he predicted that she “will vanquish” Ted Cruz and the tea party in the next election. 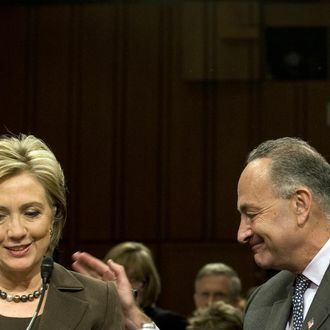 A Schumer aide told the New York Times that the endorsement “had not come at Mrs. Clinton’s request,” because the support of Establishment Democrats like Schumer is a given.